Organized by Pace e Bene Australia. Join passionate educators from around Australia to learn the fundamentals of peace and nonviolence education and ways to embed these principles into your curriculum and teaching practice. • explore and share resources and experiences to assist with embedding nonviolence principles in curriculum and practice. *Includes GST. Please note: Catholic organisations will be invoiced the cost less GST. Early bird discount will apply when you register before 31st May 2019. Book early to avoid disappointment! Visit http://bit.ly/PeaceEducationSymposium2019 to register your place. During 2018, a group of keen educators and peace-practitioners from Australia and New Zealand, mainly from the Anglican and Catholic traditions, met to discuss, develop resources and teach the ‘theology and practice of peace and nonviolence’ in Christian schools. This included the development of a pilot, senior-school religious education (RE) unit by the Anglican Schools Commission (Western Australia) and the incorporation of nonviolence principles, and content, in a number of Catholic education systems and schools. The feedback from students and staff has been very positive, with teachers observing the holistic nature of the material, which is helpful in engaging students at intellectual/theological, spiritual/prayerful, and practical (nonviolent peacemaking) levels. To promote and provide gospel-based peace and nonviolence resources to all Christian educational systems and secondary schools in Australia and New Zealand by 2021. “Nonviolence is the answer to the crucial political and moral questions of our time: the need for [humanity] to overcome oppression and violence without resorting to oppression and violence.” Martin Luther King Jr.
• consider how to integrate peace education within their teaching roles. Please note: this first day of the program can be attended as a standalone workshop, if you are unable to attend the full three-day symposium but would still like the opportunity to learn about Jesus and nonviolence. 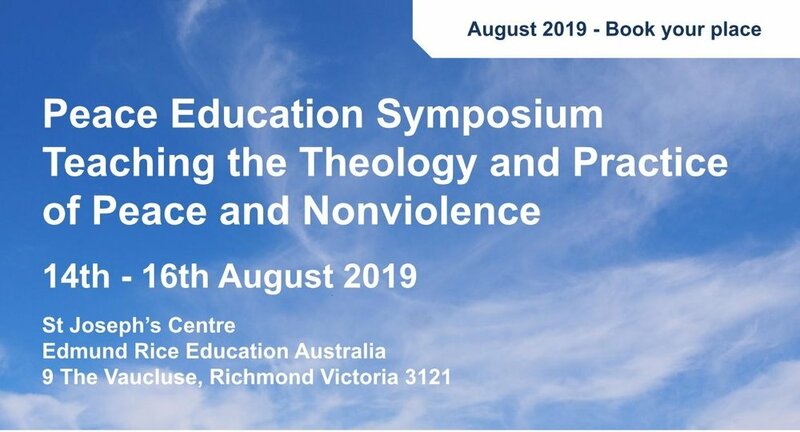 Two days of input, ideas and teaching resources from educators and peace facilitators, including those who have taught ‘the theology and practice of peace and nonviolence’ in Catholic and Anglican schools over the last 18-months. Using a ‘community of practice’ ethos, the program will include space for self-organised conversations, giving participants the opportunity to convene conversations of personal relevance and importance to their own teaching practice. • stories of nonviolence in action. Please note that accommodation is not included in your registration and we invite you to make your own arrangements. The venue is well located and easily accessible on public transport, enabling you to select from a wide variety of accommodation options in Melbourne’s central business district or eastern suburbs. We aim to make this symposium as environmentally friendly as possible and encourage you to consider offsetting your flights using an accredited carbon offset scheme such as atmosfair. Brendan grew up in the ‘troubled’ north of Ireland, surrounded by widespread cultural conditioning, scapegoating and violent conflict. He has since devoted much of his life to learning about nonviolent conflict transformation. For the past twenty-five years, he has been an Associate Staff Member with the international Pace e Bene Nonviolence Service and a co-founder of Pace e Bene Australia. Brendan works as an adult educator and facilitator, and enjoys integrating his native Irish spirit with his passion for teaching peace. Jo is a member of the Identity and Liberating Education Mission Team at Edmund Rice Education Australia (EREA). Part of her role is to support EREA schools to be educators for justice and peace through facilitating a variety of staff formation and professional learning experiences. She has a Master of Arts (Theology) from the University of Divinity and throughout her thirteen years as a teacher in two Victorian Catholic schools has held the positions of Director of Identity, Religious Education Coordinator and Service Learning Coordinator. Sally has been an educator for the past seventeen years. She has been involved in writing and implementing a wide range of curriculum, including around Rwanda’s post-genocide recovery, film and radio story-telling training, and intercultural youth-led community projects. At St Joseph’s Flexible Learning Centre in North Melbourne, she co-led and taught within the Maree program for young people seeking asylum and developed the Asylum Seeker Pathways Project. Sally is an Action Research doctoral student at Monash University and secretary of the recently established HOPE Co-Op, owned by and for asylum-seeking students. Michael is an Anglican priest, leadership coach, facilitator and teacher of dialogic (nonviolent) processes such as Talking Circles and Open Space Technology. As Anglican Chaplain at the University of Western Australia, Michael convenes a staff community of practice working on the implementation of Restorative Justice principles and practices within the university. With colleague Brendan McKeague, Michael continues to help enable the development of teaching ‘The Theology and Practice of Peace and Nonviolence’ in schools and is actively involved in teaching nonviolence approaches to leadership in the church. Simon lives in Norlane, Geelong with his wife Kaylene and three children and has worked as a community leader, nonviolent facilitator, peace educator and activist for many years. Simon holds a degree in Social Work and Masters in Social Change and Sustainability. He has been involved in providing activist training and formation programs to prepare people for engaging in civil disobedience/arrestible offences such as Love Makes a Way. Over the past twenty years, Simon has lived in some of Australia’s most disadvantaged neighbourhoods and is passionate about creating healthy, sustainable and inclusive communities as pathways to a peaceful world. Anne is the director of the Anglican Schools’ Office of Aotearoa, New Zealand and Polynesia. She came to the role after working as the Ministry Educator for the Anglican Diocese of the Northern Territory (including, memorably, Arnhem Land). Previously, she worked as a priest and teacher in a variety of roles. She has degrees in music, education, theology and a cross-disciplinary PhD (Religious Studies and Literature). One aspect of her work across the schools of her province is encouraging them to embed restorative practices in their Christian foundation, through staff professional development and most recently through a year 11 term-long work unit, developed in conjunction with Victoria University of Wellington. Dr Carly Osborn is a Visiting Research Fellow at the University of Adelaide, and the Learning Manager for educational company Makers Empire. She is the author of ‘The Theory of Rene Girard: A Very Simple Introduction’, and a co-editor of the Bloomsbury series ‘Violence, Desire & the Sacred’. Her first monograph, a Girardian reading of the American Dream and its narrative tragedies, will be released in late 2019. Carly’s passion is taking the deep insights of Girard and making them accessible to a broad community audience. Michael taught history and religion from 1994-1996 at Christian Brothers College, Adelaide. After holding Religion Education Coordinator roles at Cardijn College and St Mary’s College he was appointed as Deputy Principal Student Wellbeing at St. Mary’s where he introduced Restorative Justice as a school-wide approach for student wellbeing, conflict resolution and behaviour education. Michael joined the RE team at Catholic Education South Australia in 2011 and currently works as a Behaviour Education Consultant. In this role he divides his time between supporting teachers working with children in struggle and facilitating professional learning in the areas of developmental trauma and Restorative Practices. Michael is the Coordinator of Religious Education for Catholic Education South Australia (SA). He has been an educator for almost thirty years, a member of the Religious Education (RE) team in Adelaide for seventeen years, and its team leader for the past ten. Michael was involved in the development of Crossways: the Religious Education Framework for SA Catholic Schools and is leading its current redesign. Michael has also been a Catholic Studies lecturer for University of South Australia undergraduate education programs, in the areas of theology and curriculum design in RE. Some of Michael’s professional interests include supporting school leaders in their religious leadership, fostering the spiritual and religious formation of staff, and promoting pedagogies which honour the agency of the learner for the world that God desires. Philip has been the Director, Mission and Planning at the Anglican Schools Commission (ASC) in Perth, Western Australia, since mid-2010. Philip oversees the ASC’s Religious Studies Curriculum and convenes a range of networks from across the ASC and the Western Australian Anglican Schools Association (WAASA) of which he has been the Executive Officer since February 2012. During terms 2-4 of 2012, he was Interim Principal of Swan Valley Anglican Community School, following eleven years as the foundation Principal of Bishop Tyrrell Anglican College, Newcastle, NSW. Philip holds a Master of Education from the University of Melbourne and a Master of Ministry from Charles Sturt University. He is also a Fellow of the Australian Institute of Management. One of Philip’s great passions is equipping religious educators and chaplains in their roles of nurturing and challenging young people to explore faith and spirituality and how that interacts with the complexities of their lives.